It has been so long since I cooked a home cooked Sunday dinner. Recently I made Ina Garten’s Seared Tuna with Mango Salsa. I’m not a big “fish guy” – I love sushi but cooked fish doesn’t really make it high on my list. I have been trying to be better about it though. 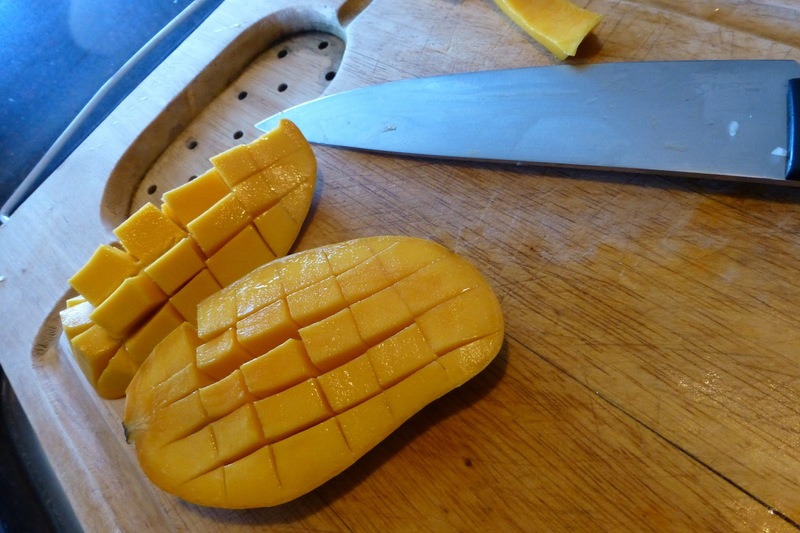 Coupling my favorite cooked (or seared) fish with one of my favorite fruits (Mangoes) sounds like the perfect dinner. After a quick trip to Whole Foods and I had all the ingredients for this dinner for two. I am still surprised at the price of tuna – you’d think I’d get use to it eventually, but I’m not yet. I was a little hesitant cooking the salsa – usually I find that a fresh salsa is more refreshing than the cooked version, but I thought I’d give it a go. The mangoes were surprisingly ripe and flavorful. The salsa creation was quick and easy. The salsa was finished in just a few minutes and then tossed into the fridge to chilled. A few hours later I prepped the tuna. Best part about the tuna portion – it takes just 5 minutes to cook. I followed Ina’s recipe pretty much as is — although I did use an additional mango, because I felt mine were a bit smaller. This dinner looked so good we jumped right in without taking a final picture of the fully plated meal. We just got so excited to eat this great meal. It did not let us down. Next time I’ll try to be a little better about taking a post prep picture. By Tim in Food on April 28, 2013 .